People are fleeing the water-scarce Bundelkhand region where land is not fertile and agricultural production is not enough for small farmers. The region, which has the dubious distinction of being the most backward in the state, just witnessed the 13th drought in the past 15 years, resulting in 15th consecutive crop failure. According to the Uttar Pradesh government, the districts in Bundelkhand region lost 70 per cent of Rabi crop due to the last year’s drought. While cases of farmer suicides increased by 42 per cent across India in 2015, at least 745 farmers in Uttar Pradesh took their lives in 2013. The Centre spent Rs 15,000 crore in the past decade to create water-harvesting structures. Over 116,000 harvesting structures (including 700 check dams and 236 minor irrigation projects) were constructed in Bundelkhand from 2006 to 2015. What the government didn’t do is focus on identifying and reviving traditional water bodies like ponds that had become defunct due to neglect. According to the latest data by the Ministry of Drinking Water and Sanitation, only 47.21 per cent of rural areas in Uttar Pradesh have been covered under the Swachh Bharat Mission, with districts like Etah, Sultanpur, Agra, Barabanki, Faizabad, Chitrakoot and Basti not even recording 30 per cent coverage. 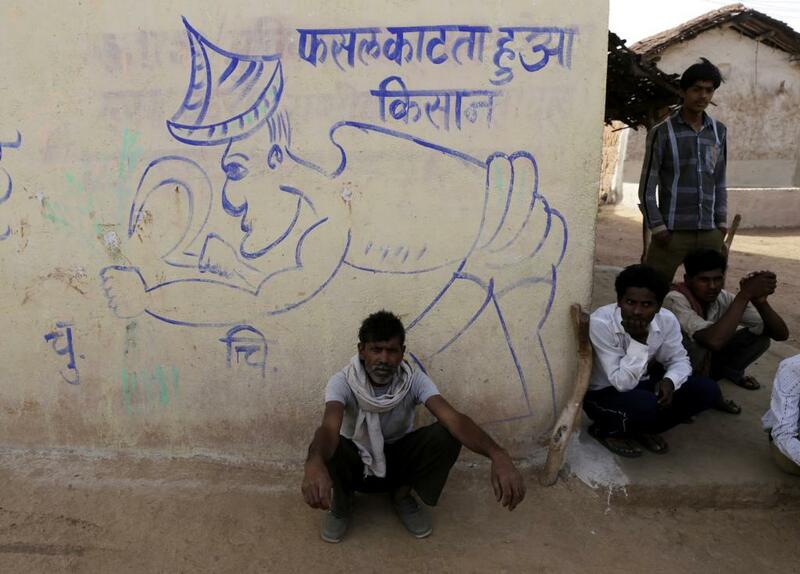 The state, however, claims having 4,743 open defecation-free (ODF) villages. With 138 million voters, greater than the population of Mexico, Uttar Pradesh has 272, 186 individual toilets, 4,251 community & public toilets and not even a single ODF city. In comparison, Maharashtra, a slightly larger state, has 88 cities that are declared ODF. Hence, there’s little surprise that “toilet for each household within five years” was a common refrain during the BJP’s campaign. Uttar Pradesh Chief Minister Akhilesh Yadav has stood by his claim that government is providing 24-hour electricity to cities and 16-18 hours a day in villages. However, a recent poll by FourthLion Technologies—a data analytics and public opinion polling firm—suggested that one-third of voters consider power cuts the biggest problem in Uttar Pradesh. If we go by the status report of Deendayal Upadhyaya Gram Jyoti Yojana, only 12 villages are yet to be electrified. However, a Down To Earth investigation revealed that what’s true on paper is not true on the ground. For the residents of Dara Nagar village in Badaun district of Uttar Pradesh, the wait for electrification has been long and tiring. Though electric poles were raised at least two decades back, they were not connected till 2016. While 35 of 350 households in Dara Nagar were officially electrified in the first-half of 2016, the villagers still prefer diesel generators because of the unreliability of power supply. Down To Earth also found gaps in record-keeping of electrified and unelectrified villages. In Uttar Pradesh, Karanpur and Fateh Nagla are considered electrified while only eight per cent and six per cent of the households get electricity. Half of the most polluted cities in India are in Uttar Pradesh with Allahabad faring worst, according to the Central Pollution Control Board (CPCB) data on air quality of 46 million cities. The data, tabled in Parliament on February 7, had five UP cities—Allahabad, Varanasi, Lucknow, Ghaziabad and Agra—among the worst in India when it comes to air quality. Varanasi, for example, is where water quality of the River Ganga is most hazardous. With sewage flowing in the river and uninterrupted cremation work on the banks, the toxic level of Ganga remains high. High level of particulate matter (PM) within the city limits is attributed to dust, vehicular exhaust, brick-kilns and garbage burning. A recent study by Delhi-based Centre for Science and Environment showed that Meerut's air quality is more threatening than Delhi, with old vehicles and polluting industries adding to woes. In case you don’t know, UP has over 18,000 operational brick kilns, which operate between December and June every year. The state produces close to 50 billion bricks a year. Although the Uttar Pradesh Pollution Control Board (UPPCB) directed all brick kilns in 2016 to upgrade technology to reduce emissions, the move met with protests. Moreover, the UPPCB does not provide live monitoring of air quality. Adding to the problem is the fact that the CPCB has online monitoring stations in only four UP cities: Agra, Lucknow, Kanpur and Varanasi. Still, neither the single monitoring stations in Agra and Kanpur nor the three in Lucknow show PM 10 levels. The per capita public expenditure on health (both Centre and states) is the lowest in Uttar Pradesh among the five states that went to polls. Goa, for instance, spends more than five times on its citizens’ health. Fewer doctors, nurses and paramedics in health care institutions are direct fallout of low spending. The community health centres (CHCs) in UP are 84 per cent short of specialists, according to the Rural Health Statistics, 2014-15. The CHCs and Primary Health Centres (PHCs) have only half the staff they should have. There has been no increase in the number of sub-centres (20,521) from 2005-2015. More shockingly, the number of PHCs reduced from 3,660 in 2005 to 3,497 in 2015. On top of that, 3,603 posts for women health workers were lying vacant as on 2015, which was a staggering rise from 431 in 2005. There is a shortfall of 4,496 nurses in primary and community health centres. About 14 per cent of households in the state have to bear the maximum burden of health expenditure, higher than 25 per cent of total household spending. Of the 36 Indian states and union territories, UP was third from the bottom in terms of infant mortality rate (deaths per 1,000 live births) across rural and urban areas, the latest Sample Registration System bulletin for 2015, released in December 2016, showed. Many relatively poor states do much better than Uttar Pradesh. Infant mortality rate, maternal mortality rate and other health indicators are far worse in Uttar Pradesh than the national average, with the district of Faizabad being one of the worst performers. With health, energy poverty and agrarian crisis jostling each other to garner attention of policymakers, the issue of poor quality of education has been pushed to the periphery. Vacancy for teachers in Uttar Pradesh is considered second worst in India for secondary schools and sixth worst for elementary schools. As many as 23 per cent positions for teacher in elementary grades (up to Class 8) remain vacant. In fact, 50 per cent of total positions in secondary schools (Class 9 and 10) are vacant in the state. Bundelkhand's cycle of droughts: is it man-made?